Not for the first time today our guest is a king who lost his throne, though this particular monarch did at least keep his head, falling foul of Napoleon and his own son's ambition in the process. 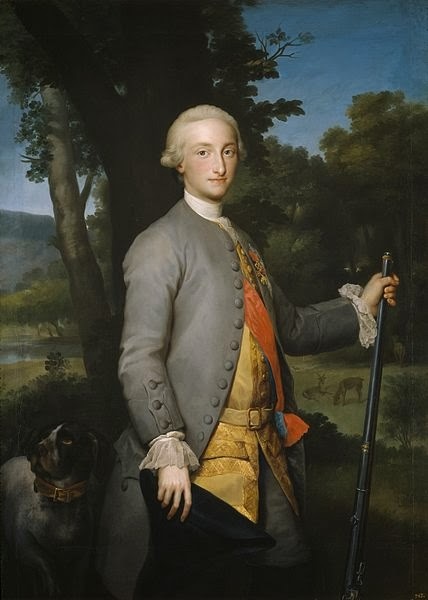 An amiable man with a love of sport and hunting but, crucially, no time for politics, today we mark the birthday of of King Charles IV of Spain. Charles was born as the second son of Charles III and Maria Amalia of Saxony. 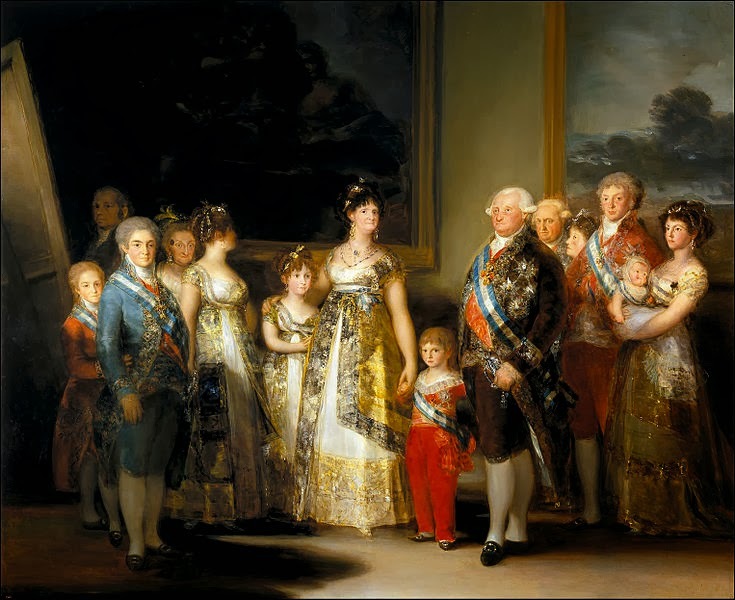 His elder brother, Don Felipe, suffered from epilepsy and numerous severe learning disabilities and was duly excluded from succession to his father's thrones of Spain and Naples and Sicily. In preparation for his dynastic duties, Charles married his cousin, Maria Louisa of Parma, in 1765 and though her reputation was to become one of manipulation and spite, the couple had 14 children, with six surviving into adulthood. Whether the bride and groom were in love is open to debate but she was certainly a powerful influence over her husband, ruling the country from behind the scenes while he indulged in his favourite hobbies. Despite being a king-in-waiting, Charles had no interest in politics or intrigue and devoted himself instead to outdoor pursuits. However, one thing he did believe was in the absolutism of monarchy and when he came to the throne in 1788, he held true to this particular belief in his own mind if not behaviour. As Charles IV, the king had no desire to rock the apparently steady boat he had inherited from his father and to this end he decided to keep the same senior, trusted officials in office. Happy to leave the responsibility of government to the prime minister, José Moñino, the Count of Floridablanca, and Maria Luisa, Charles spent many happy days hunting and riding whilst behind the scenes, political intrigues were at work. The prime minister was removed from office by enemies and replaced with Pedro Pablo Abarca de Bolea, Count of Aranda, in 1792. However, he lasted less than a year himself and was in turn succeeded by Manuel de Godoy, a man whom some gossips believed was more than just friends with Maria Luisa. 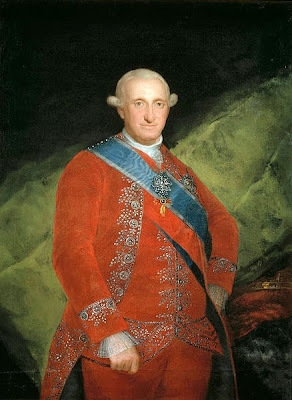 Under Godoy's leadership the country prevaricated back and forth between alliances and animosities, Charles' apparent disinterest in his kingdom and the swiftly emptying Spanish coffers doing little to endear the king to his people. Indeed, his own son, Crown Prince Ferdinand, planned a failed coup in 1807 in an attempt to take the throne. Just a year later, the people of Spain had grown tired of their disinterested monarch and marched on the winter palace at Aranjuez. Godoy was arrested and the king bowed to public pressure to dismiss him. Just a couple of days later Charles himself was forced from office in favour of Ferdinand. The abdicated king appealed to Napoleon for assistance in taking back his throne but found that his intended ally had other things in mind. With huge numbers of troops stationed in Spanish territory, Napoleon used this leverage to convince both Charles and Ferdinand to abdicate, declaring his own brother, Joseph Bonaparte, King of Spain. Along with Godoy and Maria Luisa, Charles was help prisoner in France until King Joseph lost his throne and Ferdinand was returned to rule. With his throne lost forever, the former king Charles IV of Spain spent some time searching for a place in the world, eventually establishing himself in Rome at the Palazzo Barberini. Utterly bewildered by the events that had caused him to lose his throne to the end, Charles returned to his hobbies though perhaps with slightly less enthusiasm than before. He remained in Rome until the end of his life, dying a month after his wife in 1819. I am intrigued by the family portrait - who is the chap slightly in the shadows on the left? It's Goya himself; I shall add a caption to identify everyone! Yes and to turn to Napoleon for help in regaining the throne was not the wisest decision! Idealism and Enlightenment sentiment were just too high at this time in history to let this type of monarch continue, I think. Too many government overthrows in Europe to have the Spanish people allow the crown to be an absent and extravagant spendthrift king. They could see that people could have some sort of expression in who ruled, to allow him to continue. I think you're absolutely right - Europe was just going through too much upheaval for a king to occupy himself with hunting and fishing!